When the Baader Hyperion eyepieces were introduced in May 2005 the similarity to the Orion Stratus, which had appeared on the market in early spring, was quite easy to see. But while the outer appearance, the lens buildup and many details of the Hyperion resemble the Stratus, there are some visible differences between both series. After Baader provided me the complete range of focal lengths for a test I was able to compare them directly with the four Stratus eyepieces I still had available from their review. The Hyperions come in a quite stable cardboard box together with the same leather bag we already know from the Stratus. Upmost in the package I found an additional lens cap and this turned out to be one of the many well thought details that make the difference with the Hyperion series. There's one lens cap fitting with the rubber eyeguard flipped down and another one for the eyeguard in its original position. So if you wear glasses there's no need to flip the eyeguard up before putting on the lenscap. This makes switching focal lengths more comfortable. Like the Stratus the Hyperions can also be used in a 2" eyepiece holder, but while the Stratus has only a very small area for the fastening screw the Hyperion has a broad area and even a safety groove. Of course there's also a safety groove on the 1.25" barrel, but unfortunately it is cut in a little deeper than necessary. Comparing Hyperions and Stratus directly with each other it becomes apparent that the eyepieces of equal focal lengths differ in size. A close look reveals that the field lens of the Hyperions is positioned lower in the 1.25" barrel. I was informed by Baader that after this change the Hyperions also work in some spotting scopes with little backfocus. 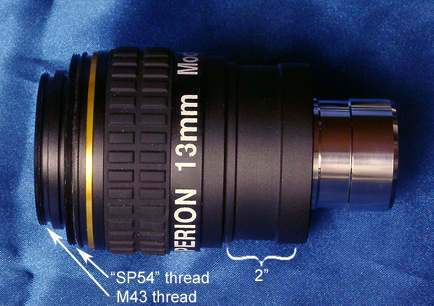 Because the Hyperion is positioned somewhat deeper in the 2" eyepiece holder, the 1.25" barrel was also shortened to prevent it from scratching the diagonal. However you should be careful when inserting a Hyperion into your 2" diagonal for the first time, just to be sure. Between the nice rubber armor and the folding soft eyecup there's another ring of silicone rubber. Under this cover you will find a thread for Baader's 'SP54' camera adaptors. These threaded rings allow almost any kind of camera to be attached directly onto any Hyperion eyepiece. There is a large number of these - quite cheap - adaptors available for the 'SP54' thread to use a wide range of digital cameras for afocal projection. At the moment there are adaptors for M28, M37, M46, M49, M52, M55, M58 and M62 threads as well as one SP 54 extension ring. These afocal adaptors ensure a very short distance between camera lens and eye lens which is necessary for a good image illumination. Pulling off the folding silicone rubber eyeguard itself discloses another thread. This measures M43 and directly fits onto some camcorders (e.g. Panasonic). The same M43 thread also accepts an optional M43/T-2 photo-adaptor made for the Hyperion series. This T2 adaptor can be combined with optional T2 extension tubes for eyepiece projection with a (D)SLR-camera and it can additionaly get equipped with a Baader T-2/1.25" eyepiece holder to accept various makes of webcams or firewire cameras for classical eyepiece projection work. In all the cases mentioned above the camera can be firmly screwed onto the eyepiece. This setup is very sturdy while still as lightweight as possible. Of course the telescope focuser has to be able to take the weight of the camera but this should be no problem with most 2" holders. As a benefit there are no problems about centering the camera exactly behind the eyepiece. Trying the afocal adapter with my Casio QV 3500 EX I found that it mounted the camera about half a millimetre too close so the camera lens couldn't be extended. Considering the number of different cameras available this was just bad luck with my camera. But when I told this to Baader they informed me that they will add a washer to each adapter to solve this problem. Fixing my adapter by jamming some plastic into the thread I finally found the image illumination very good and better than anything I achieved with my old adaptors. Another feature of the Hyperion series is the possibility to change focal length of the eyepiece by screwing off the 1.25" barrel, by this using the eyepiece without the built in Barlow lens. The eyepiece becomes a 2" eyepiece with about 35mm focal length. The threading can now be used to attach standard 2" eyepiece filters. Trying this I had some problems with the eyepiece screwing apart at the wrong place: Sometimes the 1.25" barrel got screwed off and sometimes the upper half of the eyepiece became loose. Reporting this to Baader they told me that the next series of production will have all other threadings secured with a special glue to prevent this. However as the Barlow lens (or negative element) is part of the eyepiece design the edge performance suffered. The following observations had to show if the eyepiece could work well enough without it, and if this was depending on the type of the used telescope. More about this later. Another idea to change the focal length appears to be much more promising. Another amateur astronomer wanted to screw a 2" filter between the Barlow element and the upper part of the eyepiece. Doing so he found the focal length slightly shortened which got him the idea to screw in a number of empty 2" filter holders to shorten the focal length. It is possible that Baader will offer special extension tubes for this purpose. Workmanship of the eyepiece is OK considering the price. The paint of the blackened filter thread inside of the 1.25" barrel was shiny in some places. The lens holders are made of black anodized metal while I would've liked them to be painted flat black as well. Looking into the eyepiece I saw some shiny areas especially at the longer focal lengths. They might resemble the problem with the paint mentioned above. Talking about this with Baader I was told that the paint used here is a special 'glue-paint' intended to capture dust particles that might get into the eyepiece after screwing off the Barlow lens. Repainting the barrel here would be probably useless, as this area should be out of the optical path. The lens edges are blackened and there is the same bright edge of the coatings I already noted looking at the Stratus. But this area should be well out of the optical path as well. The coatings differ in colour between Hyperion and Stratus. The last point considering the outer appearance was the labeling. It's big enough to be read with a gloomy red light but it takes a while to find the focal length because the numbers have the same size like the other letters. The different focal lengths are also discernable by a coloured ring but this won't work under red light. As already mentioned the Hyperions use the same lens buildup as the Stratus. The Hyperions however feature Baader's 'phantom group' multicoatings and indeed the reflections show a different color than those of the Stratus. Another thing to look at during actual night observations (which will be described later). To compare the lens buildup each eyepiece was photographed in the same position so to compare the position and size of reflections, like I did with the Stratus in my former review. That way I compared the Hyperions with the Stratus and the Vixen lanthanum wide angles. Some slight differences occurred due to the different size of the eyepieces. The images show that the lens buildup is indeed the same for Hyperion, Stratus and even for most of the Vixen originals. Of course the 22mm Vixen is different from the 21mm Hyperion and Stratus. Furthermore there was a thin reflection that was different between the 21mm Hyperion and 21mm Stratus and I believe this reflection was caused by a cemented lens surface. Comparing the three brands by looking through the eyepieces from a distance showed no 'yellow tint' or any notable difference whether I looked at a lamp or at the landscape during daylight. I also tried this using a slide illuminator and saw no difference between the three brands. 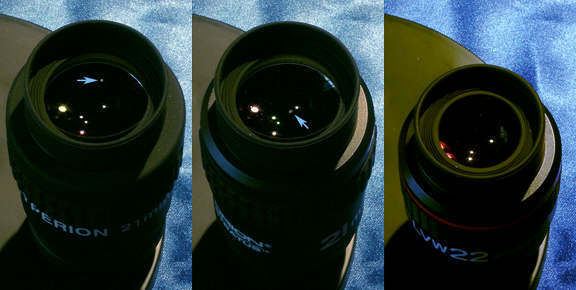 Very similar reflections of the 13mm Hyperion (l.), the Stratus (m.) and the LVW (r.). Some reflexes become invisible on the LVW’s smaller eyelens. ...but some differences at 21mm and 22mm. The arrows mark each different lens flare of the 21mm Hyperion and Stratus. Performance of the Hyperions with 8" f/4 Newtonians (Vixen R200SS and a GSO 600) was almost identical to that of the Stratus. Eye relief is the same and the eyepieces show almost no kidney-beaning. The soft rubber Hyperion eyeguard works even better than the slightly firmer one of the LVWs. No problems with glasses with any of the eyepieces. 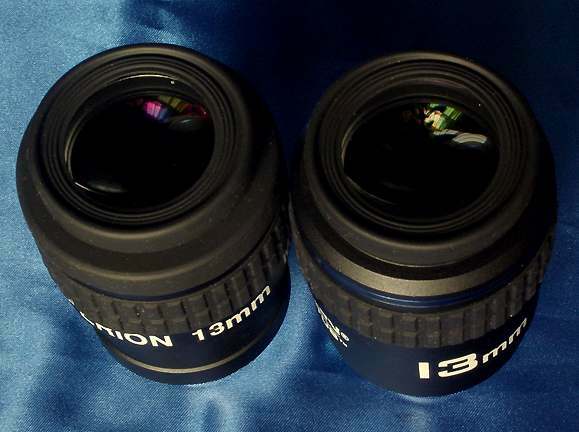 A direct comparison between the Hyperion, the Stratus and the LVW originals revealed that the edge sharpness is better on the 13, 17 and 22mm Vixen eyepieces becoming gradually less apparent with focal length becoming shorter. The effect was hardly noticeable at 8mm and disappeared with the 5mm and 3.5mm. At 5mm and 3.5mm focal lengths the image was virtually the same in all three eyepieces. Like the LVW the Hyperion and Stratus show slightly enlarged star spots with the 8mm and 5mm focal lengths. Observing the Moon and Mars showed very similar results. But all three 3.5mm eyepieces lost against the (much more expensive) 3.5mm Nagler type 6. Looking at Mars and at globular cluster M13 the Nagler delivered a little more contrast and slightly smaller stars. Observation with an 8" f/6 Newtonian started with a thorough comparison between the 21mm Hyperion and Stratus. The 22mm LVW and the 21mm Pentax XL of a friend were brought in, too. First we compared edge sharpness. The LVW 22 performed best with an all but perfect image across the whole field. Close to the edge of the field the stars were slightly enlarged, but this was not easy to notice. Both 21mm Hyperion and Stratus followed closely and performed identical. They lost some sharpness towards the edge of the field, mostly due to curvature of field. Surprisingly the Pentax-XL finished on the last place in this discipline. Stars close to edge were visibly blown up, but of course the effect was not too bad and the XL performed still well. The XL however performed best when looking after scattered light. It showed an evenly black sky background while both the Stratus and Hyperion showed a broad ring of brightened background about the edge of the field, of maybe ten or fifteen percent of the apparent field. Looking carefully into the 22mm LVW we found that it showed the same effect, only much, much weaker. We only noted this when we knew exactly where to look at after seeing it in the Hyperion/Stratus eyepieces. Finally we compared the number of visible stars to find out about transmission differences. We found NGC 7789 to be a good object as it was close to the zenith and had an interesting asterism of five stars that differed slightly in brightness, resembling the look of the number five on a dice. The middle star could be easily seen with direct vision. The four outer stars were a little harder to catch and one of them was quite difficult even with averted vision. So we are talking about very slight differences which will be only noticeable in a direct comparison and careful observation. The Pentax XL and the LVW were very close together, showing all five stars with direct vision (without a drawback because of the LVW's longer focal length). The Hyperion was very close to those two, maybe a little behind. The Stratus was clearly not at the same level. Only four stars were visible with direct vision and three of them only with some effort. So it seems like Baader's 'phantom group' coatings really help to enhance the eyepiece's performance. On another evening we observed M38 with the 13mm eyepieces with similar results. The slightly better performance of the Hyperion showed on a weak star that could be seen directly with the Hyperion but only with averted vision in the Stratus. With the 13mm eyepieces however we found no star that was visible with averted vision in the Hyperion or LVW and invisible with the Stratus. All three 13mm eyepieces performed well on axis. The LVW showed better sharpness close to the edge of the field that could be corrected by refocusing slightly. Hyperion and Stratus showed less sharpness close to the edge and refocusing didn't help much. Comparing the 8mm focal length, the LVW and Hyperion showed almost the same performance. Only close to the edge the Hyperion lost a little bit of sharpness. At 5mm and 3.5mm we found no difference between Hyperion, Stratus and LVW, and we found the same number of stars visible with direct and averted vision. The slightly lit up edge of the field could be seen in all Stratus and only a little less in the Hyperions, becoming weaker with shorter focal length. It was invisible in any LVW but the 22mm. Using a 12" f/4 Newtonian I tried to repeat the experiment concerning transmission observing M76 and the weak stars surrounding it. Though I compared the eyepieces very carefully I found no difference concerning the visibility of stars, be it with direct or averted vision or details of the Little Dumbbell. Any possible advantage of the Hyperion's coatings remained invisible. After the clones performed quite well on f/4 and f/6 telescopes I had quite some expectance about using them with a C8. But like before the curvature of field proved to be a problem for Stratus and Hyperion. Once again edge sharpness was better with the LVWs and also with a 14mm XW Pentax. At least the clones worked better on the C8 than with the f/6 Newtonian. The performance on axis was good again. Using a 90/1000 (f/11) achromate brought very similar results. Another thing to look at was the detachable Barlow lens of the Hyperions. Using it without the negative element drastically changed the performance of the eyepiece. The eye relief became really short so I had to flip down the eyeguard to get close enough. I can't tell you how close because it was just impossible to see the whole field that suddenly stretched to a gigantic 90° or something. However at a focal ratio of f/6 only 40° of the field had a good sharpness and not much more than 50° were really useable. With f/4 this gets even worse. So without its Barlow a Hyperion is not much more than a finder eyepiece for bright objects, with about 35mm or 40mm focal length. Then I made some observations with an extended distance between Barlow and the upper part of the eyepiece. It worked quite good without much change of edge sharpness and no loss of on axis sharpness. around the Moon was a little greyish but it seemed not more than I had seen with other eyepieces under similar conditions (there's no alpine sky on my balcony, you know...). Sweeping the moon out of the field I found a reflection in a distance of about one degree (actual field of view of course). The reflection didn't change whether I used a Hyperion, Stratus or LVW so I guess it might've been caused by the telescope which has quite a short tube. Looking at the Moon again I noticed the 8 - 21mm Hyperions showing some greenish color on the edge of the moon that turned orange with the 5mm and 3.5mm. 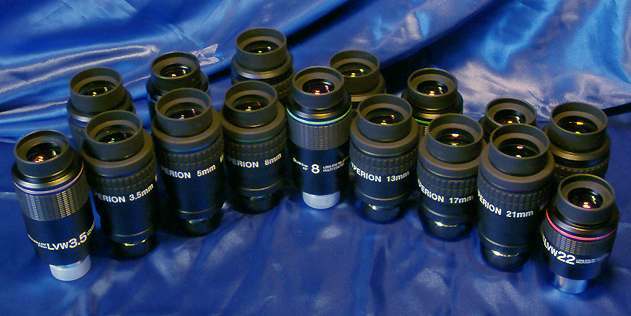 So after all I found the Hyperion eyepieces to be quite similar to the Orion Stratus series. What makes them clearly better than the Stratus is the cleverly designed housing that allows to adapt a wide range of camera equipment. They deliver a unique combination of wide angle, long eye relief, good performance with fast focal ratios, versatility and cheap price. So if you don't want to pay double price for the advantages of an LVW or similar, a Hyperion is a very good choice. The Hyperion is also a good choice for a use as an eyepiece for public demonstration in an observatory. The nice eye relief and comfortable view will help inexperienced visitors to observe any kind of objects. 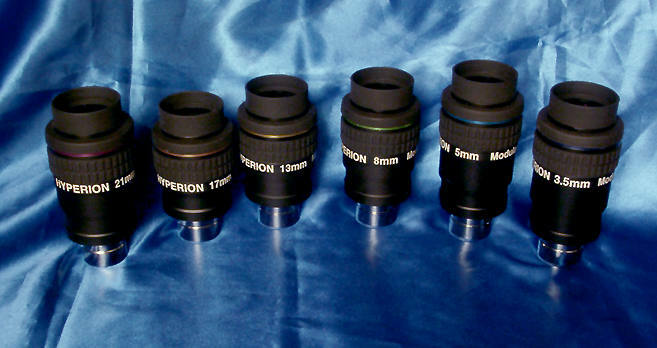 The Hyperions may not be top notch in every discipline but they are upper class eyepieces for a relatively low price. Many thanks to Amalia for her assistance and proofreading of this report.